If you have been injured in a bus accident, the first priority is always to make sure that you and your loved ones receive prompt medical attention. Next, it is in your best interest to contact an experienced bus accident attorney, as soon as possible. There are regulations that are specific to bus companies and government transit lines. 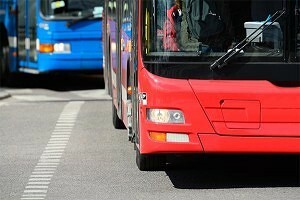 An experienced bus accident attorney will be able to determine how they apply to your case. 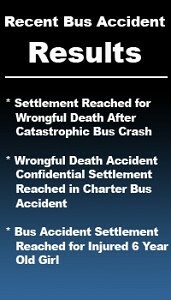 Also, there are statutes of limitation that restrict the amount of time you have to file a personal injury claim after a bus accident. We urge you to contact Cellino & Barnes, so we can help you make sure your case is handled properly and that the filing deadlines in your case are protected. In the United States, more than 23 million children ride on school buses every day. Most children return home safely, however, bus accidents do happen. Injuries can range from bumps and bruises due to a slip and fall accident, to a tragic injury resulting from a child being struck by an oncoming vehicle. In all 50 states, motorists are required to stop when school bus lights are flashing. Unfortunately, this law is not always obeyed. Police officers throughout the country have found that drivers fail to obey this law, which may result in tragedy. Use a Safe Location. Have a safe place to wait for your bus, away from traffic and the street. Stay in Place. Stay away from the bus until it comes to a complete stop and the driver signals you to enter. Make Sure You Are Visible. When you exit the bus, walk at least ten steps away from the bus. This makes it a lot easier for the bus driver to see you. Get On and Off Safely. Use handrails to enter and exit the bus. Be Alert. Be aware of the traffic around you. Although drivers are required to obey traffic laws, they sometimes fail to do so. Protect yourself and be alert. The National Highway Traffic Safety Administration (“NHTSA”) reports between 1995 and 2005, approximately 1,500 people lost their lives as a result of school bus-related accidents. Although a large majority of people killed were occupants of other vehicles, an average of 16 children are killed each year in school bus-related accidents. Most of the fatalities occurred to pedestrian children after school. If you or a loved one has been injured in a serious bus accident, please contact one of the experienced bus accident attorneys at our law firm for a free consultation. Another issue that commonly arises after a bus accident is whether seat belts should be required. Some experts believe seat belts are not necessary mainly due to the sheer size and weight of a school bus. They also believe requiring the installation of seatbelts would only add a financial burden to many school districts. Other experts believe shoulder and lap belts would certainly limit the number of injuries and would save lives. If your child has been injured in a school bus accident and you don’t know what to do, the bus accident injury attorneys at Cellino and Barnes can help. Call us now at (800) 888-8888 or contact us for a free consultation 24/7. Helping bus accident victims across New York State, including, Manhattan, Long Island, Buffalo, and Rochester, New York.